I made this recipe about a month ago. It was one of the dinners that we brought to our friends house for our weekly dinners. Candace asked about the recipe, which reminded me to post it. But, I could not for the life of me remember where it came from. So after some searching, I found it in my email from Kraft Recipes. Of course, I should have figured it was Kraft. Any how, it's easy, delicious and will leave you with a good amount of leftovers. Enjoy! I ALWAYS forget to take pictures before we go to their house. Then I grab a crappy phone pic. This honestly doesn't do the meal any justice! ADD seasoning mix to chicken in medium bowl; toss to evenly coat. HEAT dressing in large skillet on medium-high heat. Add chicken; cook and stir 5 min. or until evenly browned. Spoon into 1-1/2-qt. casserole; cover with layers of beans, corn, onions and salsa. BAKE 20 min. Top with cheese; bake 5 min. or until melted. Serve over rice. This recipe comes from Taste of Home magazine. I've had it in my recipe binder for a while now and was in need of a chicken recipe this past week. I'm not a sauce master yet, but this has been my best yet. The sauce was good on the chicken but it was AH-MAZING on white rice. Enjoy! In a skillet over medium heat, cook chicken in 1 tablespoon butter for 4-5 minutes on each side or until juices run clear. Remove and keep warm. Add wine to the pan; cook over medium-low heat, stirring to loosen browned bits from pan. Add cream and bring to a boil. Reduce heat; cook and stir until slightly thickened. Stir in rosemary and remaining butter until blended. Serve sauce with chicken. Yield: 2 servings. For Mother's Day we decided to grill out and take advantage of the gorgeous weather. Here are a few of the recipes we used. The chicken was from Food Network Magazine and the other was from Kraft Foods Magazine. Enjoy! REFRIGERATEseveral hours or until chilled. A big thanks to Kendall at Keeping up with the Joneses for sharing this delicious recipe. I'm over my usual breakfast of granola bars and toast. I decided I wanted to make muffins for work this week and knew exactly where to visit for the perfect recipe. These took no time to whip up and were the perfect Saturday treat. I'm looking forward to having them this week for breakfast! Lightly spoon flour into dry measuring cups; level with a knife. Combine flour and next 5 ingredients (flour through nutmeg) in a medium bowl; cut in butter with a pastry blender or 2 knives until mixture resembles coarse meal. Combine buttermilk, egg, and rind; stir well with a whisk. Add to flour mixture; stir just until moist. Gently fold in blueberries. Spoon batter into 12 muffin cups coated with cooking spray. Bake at 400° for 20 minutes or until the muffins spring back when lightly touched. Remove muffins from pans immediately, and place on a wire rack to cool. Combine lemon juice and powdered sugar in a small bowl. Drizzle glaze evenly over cooled muffins. Whenever Pillsbury rolls are on sale, I stock up. There is just so much you can make with the dough. This is a recipe hubs and I created together. We had chicken and veggies we wanted to use and I was more than pleased with the outcome. This meal took 15 minute to make and another 15 to cook. It was so easy and can be made many different ways. Enjoy! Cook chicken. Bake, boil, fry. However you would like. I boiled. Sauté red peppers and mushrooms. Spoon chicken, peppers and mushrooms in center of the dough. Fold dough over to create a pocket. Pinch edges together to seal. Sprinkle salt and pepper on the top of the dough. Bake at 350 for 15 minutes or until dough is slightly brown. Every since one of my best friend's had her baby last month, we've been having weekly dinners. Hubs and I bring dinner every Thursday, my new favorite tradition. I'm always on the lookout for a recipe that I can make ahead of time and bring over hot. I came across this one at Keeping up with the Joneses. I also borrowed her picture, because I forgot to take one at home and my phone pics didn't turn out well. Anyhow, delicious recipe. Definitely will make it again. Enjoy! Preheat the oven to 350. In a food processor, combine the drained red peppers, alfredo, shredded parmesan and red pepper flakes. Process until smooth, stopping to scrape down sides. In a bowl, combine the chicken, cream cheese, spinach, pepper and garlic salt. Lightly grease 11x7 inch baking dish. 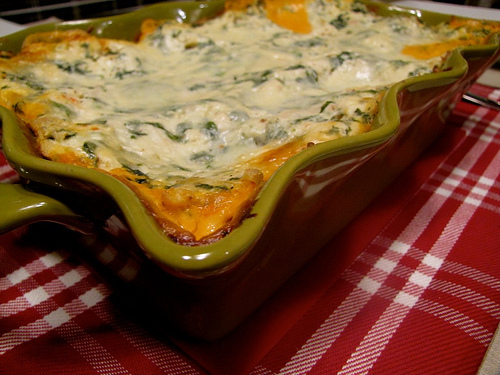 Layer dish with one-third red pepper sauce, 3 noodles, one-third of spinach mixture and one-third cheese. Repeat twice to finish. Place on a baking sheet and bake, covered, for 50 to 55 minutes. Uncover and bake 15 more minutes. I love tomatoes and mozzarella. Love, love, love it! When I came across this Rachel Ray recipe, I knew I had to add it to my weekly dinner list. I have to say, I'm not a huge Rachel Ray fan. I don't enjoy watching her show, but the lady can cook and I have enjoyed the recipes I've made of hers. This one is now at the top of my list. It was very easy to make and so delicious. We decided to drizzle balsamic vinegar on top instead of EVOO. Enjoy! Season the chicken cutlets with salt and pepper. Drizzle with EVOO and balsamic, and place on grill. Cook for 2-3 minutes each side. There shouldn’t be any pink in center of breast. Take off the grill and place on 2 separate dinner plates. Top with tomato and mozzarella slices, and garnish with basil, a drizzle of EVOO and salt and pepper. Last weekend, we hosted Mother's Day dinner at our house. We decided to grill out (those recipes to come) and I thought this bowl would be the perfect ending to our dinner. It was cold, light and fresh. This was another recipe that popped into my inbox from Kraft. I was able to prepare it earlier in the day in order for it to have 2 hours to chill. When I first started making this dish, I became instantly frustrated because the darn wafers would not line up around the bowl. Every. Single. Time. I lined them up, they all fell over. It was a domino effect. After walking away a few times, I decided to line the wafers up with the bottom facing out. That worked. Thankfully. The rest was easy to make. But, this dessert didn't taste like tiramisu to me, it didn't have enough of the coffee taste. Nonetheless, it was enjoyed and eaten. 2 LINE 2-1/2-qt. bowl with 24 wafers; drizzle with 1/4 cup coffee. Top with half each of the pudding mixture and chocolate. Repeat all layers.